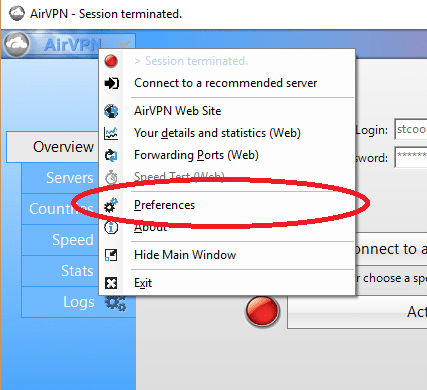 Mandee Rose | Posted on February 12, 2019 February 12, 2019 | Leave a comment on AirVPN Review 2019 – How Secure is AirVPN? AirVPN’s website is not very well organized. The use of forums for support might put off those who are not so involved in technology. However, the application installs itself and, once you have it up and running, you will find it a lot more user friendly than the website. How Much Does AirVPN Cost? AirVPN’s European base explains the pricing system, which is valued in euros. Listing the date when each of the plans would expire if you took one out today is a nice touch that rival VPNs don’t include on their pricing pages. The price puts this VPN service at the cheaper end of the industry. Those who just want a short-term VPN to get through a specific task will be well served by the three-day subscription period. If you live in Europe, you will find it very difficult to buy any digital service completely anonymously. The EU has tightened up on the delivery of digital services and the payment of sales tax. This is due in the buyer’s country, rather than the supplier’s. This legal requirement puts the onus on the seller to confirm the buyer’s location, with two pieces of identification to confirm the location as well as the Internet Protocol (IP) address. The gift voucher option offered by AirVPN is a way to get around this restriction, because the obligation to prove identity is placed on the seller of the gift card, rather than on the provider of the service. However, ultimately, there is a trail that the seller could be forced to reveal under pressure from a court order. In addition to credit and debit cards, PayPal, and gift cards, AirVPN offers a very wide of payment options. AirVPN is one of the few VPNs in the world that can skirt internet controls in China. This means it will also be able to avoid detection in other repressive countries. This is important, because not only do many countries ban access to a long list of websites, but they also frown on the use of VPNs. It is unusual that this VPN service only includes one VPN protocol option. Most VPNs offer alternative protocols, such as Point-to-Point Tunneling Protocol (PPTP) and Layer 2 Tunneling Protocol (L2TP). However, AirVPN only uses OpenVPN. This is a little unfortunate for those who want to use a VPN in China, because the authorities there often block one VPN protocol while leaving others alone, so when you are in China and you find your VPN traffic starts to get blocked, you can resolve the problem quickly by just switching protocols. 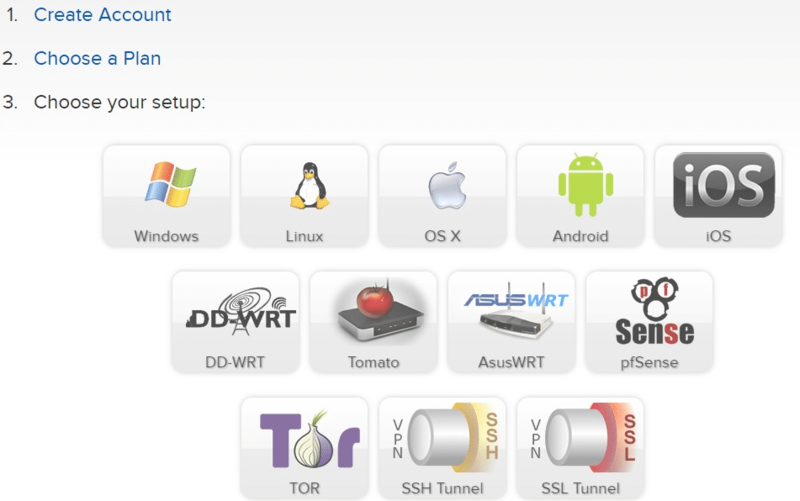 AirVPN gets around the Chinese restrictions by using SSH and SSL tunneling. This method seems to work, and gets AirVPN through the Great Firewall of China. Another security feature that puts AirVPN into a very small elite is the strength of its key exchange encryption. The VPN client on your computer needs to have the same encryption key as the remote VPN server to which it connects. The need to distribute keys is a weak point in security, because if a snooper can crack this stage, he has access to the key, so can decrypt all of the traffic that is supposed to be protected by the VPN. AirVPN uses 4096-bit RSA encryption for key distribution. This is a very secure form of protection and only a handful of VPNs implement this length of encryption key. Another potential weak point in encryption key usage is the practice of re-using keys. As the key distribution phase is bothersome, time consuming, and open to vulnerabilities, some VPN companies just leave the VPN client with the same encryption key for all its connections. This practice gives snoopers a better opportunity to crack the code, because they can continue their brute force guesswork every time the VPN connects. AirVPN uses Perfect Forward Secrecy. This means that the VPN client gets a new encryption key each time it connects. The result of this is that anyone trying to crack the key has to start all over again for each session, so will never have any hope of breaking it. The encryption used for each session, once the key has been acquired, is Advanced Encryption Standard (AES) with a 256-bit key. This is the VPN industry standard and is also used by Transport Layer Security (TLS), which is the encryption methodology behind HTTPS. The EU keeps trying to enforce a data disclosure standard across Europe. Fortunately, the EU’s own data privacy rights usually strike these attempts down. However, this means that the requirements for traceability on the internet, and activity logging by digital service providers, tend to rise and fall inside the EU. Some countries, such as Romania, have very strong civil rights legislation, which immediately quashes any government attempts at implementing EU directives on data disclosure. AirVPN is based in Italy and so is vulnerable to this EU legislation. However, it states that it does not keep any activity logs. Although the full data disclosure law is implemented in Italy, AirVPN points out that this places a requirement on ISPs and not VPN services. Thus, it refuses to keep activity logs. Before you buy a subscription to the AirVPN service, you need to set up an account. The registration process is straightforward and, if you want to keep anonymous, you could just set up a temporary webmail account to use with the service. The email address you give has to be an operational account. The security challenge is a little different to the usual check. You don’t type in the characters that you see, instead, you have to put in the answer of the mathematical equation that is shown. So, in the example above, you would enter 5. One good feature of the AirVPN registration process is that you don’t actually have to wait for an email and confirm your address with an activation link. 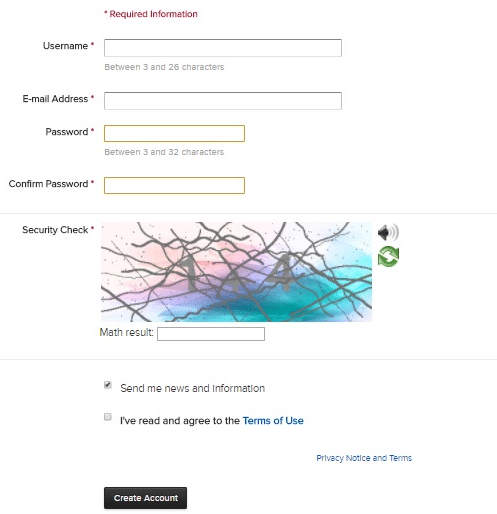 As soon, as the registration form is processed, AirVPN automatically logs you in to the system. Before you register, you are not allowed to pick a plan and pay. After the registration phase, these blocks are removed. Click on the subscription period that you want to take out. AirVPN will then immediately generate and show you an invoice. If you bought a pre-paid gift voucher, you enter the code of the voucher in the bottom left of the screen. By this method, you don’t have to enter any more personal details in the system. So if you gave a fake name and a temporary email address at the registration phase, you are completely anonymous to the AirVPN system. 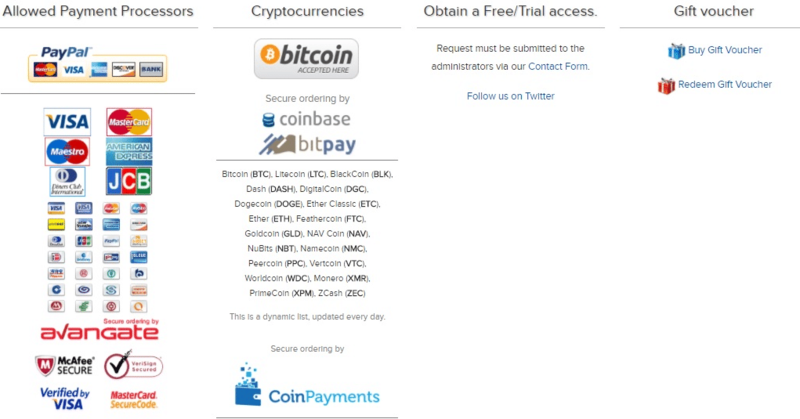 You will receive a subscription confirmation notice at the email address you gave when registering. 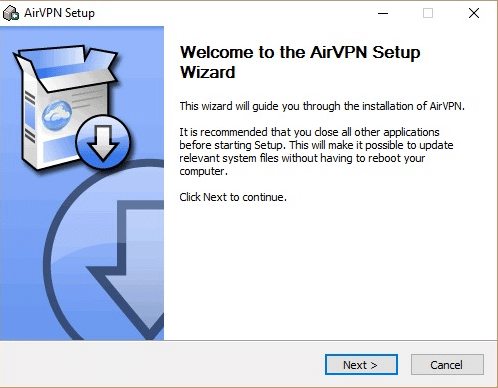 After paying, you are into the final phase of getting AirVPN on your computer. Select your operating system from the list of options to continue. You next have to specify the type of install file you want for the user interface to download onto your computer. The interface is called Eddie. Click on the Download button and wait for the file to transfer. Click on the downloaded file to open the Install Wizard. Just click through the screens of the wizard to get the program installed. The installation process doesn’t create an icon on your desktop, so you have to look for it in your program listing off the Start menu. The first time you use the app, you will have to enter your username and password. These are the credentials that you specified when you opened an account with AirVPN. They are the same username and password that you can use to log into the Client Area at the website. Make sure you check the Remember box so you don’t have to enter your details the next time you use the app. The app is pleasantly uncluttered and will not frighten non-technical users. You can choose to select the default server by clicking on the big button in the middle of the app. 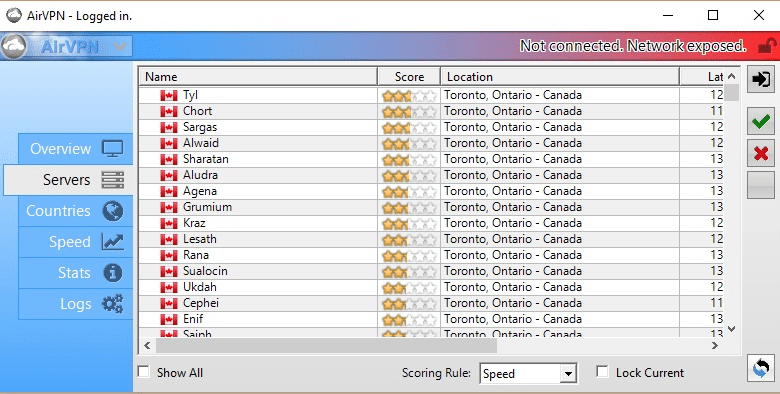 However, if you want to get around regional restrictions, you need to pick a specific server. The server selection process can be a little complicated. The server list is jumbled up by an ordering criteria that can be changed. However, if you just want a server in a specific country, you are better off going to the Countries tab first. Click on the country that you want to connect to and press the check button at the right of the screen. Next, click on the Servers tab. The list of servers will be reduced to just those in the country that you want to connect to. Double click on one of the servers to get a connection. You can access the app’s settings by clicking on the AirVPN button at the top left corner of the interface and then selecting Preferences. AirVPN doesn’t have live chat for support. Instead, you can look through the forum for guides and answers to common problems. You can raise a support request by clicking on the Support Tickets tab in the client area of the website. You will then be contacted by email with a solution to your problem. It is unfortunate that all of the support options are located on the AirVPN website, because the site is blocked in China. If you plan to use the VPN in China, make a note of the technical support email address before you go. This speed is extremely good for local conditions, and this should be noted when considering the results of the following tests. This shows that AirVPN is not one of those VPN services that can improve poor internet connections. AirVPN gave a slight improvement in performance. However, it should be noted that small changes in speed could be due to variations in local connection speeds rather than the performance of the VPN company. Should I Subscribe to AirVPN? The ability to get through the Great Firewall of China and the strong security measures that the VPN includes are great for those who intend to travel. You don’t need to be headed to China to benefit from this VPN, though, because it will work equally well in other repressive countries that try to block VPN traffic. Unfortunately, the server network is not that extensive. If you want to get into the streaming services of TV stations and video delivery services back home, you need to be able to select a server in that country. As AirVPN only has a server presence in 18 countries, you might be disappointed. Surprisingly, even though this company is run from Italy, the VPN does not offer an Italian server. Despite strong security and tunneling systems, AirVPN isn’t able to get around the proxy detection system of Netflix. It does get around BBC iPlayer’s proxy detection, though.